The planning application by the Earth Trust to construct the Radley Wetland Centre on land next to Thrupp Lake has been stalled by an objection from the Oxfordshire County Council Highways Authority. However, such was the prevailing support for the proposal that, at the recent meeting of the Vale of White Horse District Council Planning Committee, Councillors, rather than refuse the application in line with the officers’ recommendation, delegated the matter to the officers, instructing them to engage with OCC Highways and the applicant to overcome the objection, and, when this is done, to grant the permission. If, and only if, they are unable to resolve the objection, then the matter will come back before the planning committee. In the latest instalment of the Radley Lakes saga, the Earth Trust (formerly the Northmoor Trust) has applied for planning permission to demolish the house at Sandles, next to Thrupp Lake, and to replace it with a purpose-built visitor centre located nearby at the edge of the lake. The proposal is a key part of well-publicised plans to create a community nature reserve at Thrupp Lake following its gifting to the community by the power company, RWE npower in 2008. Officers and councillors agreed that the proposal was of high quality and met or exceeded all the criteria for receiving permission, except for those raised by Highways. These mainly arise out of concerns about ability of Thrupp Lane to carry, in reasonable safety, the modest amount of extra traffic that the proposal would generate . When examined, the issue was found to be essentially about the existing state of Thrupp Lane and its capacity to carry the heavy lorry traffic currently imposed upon it by concrete and aggregates businesses in the lane (businesses whose presence was only ever meant to be temporary). Moreover, in view of the fact that it is the Highways Authority that is ultimately responsible for ensuring that Thrupp Lane is safe and reasonably fit for purpose, councillors felt that the authority had been ignoring the problems in the lane and that, in the present circumstances, it could be more helpful. As one councillor put it, “the Highways Authority is operating an unsafe facility” and so have some responsibility for helping to address the underlying problems beyond simply raising objections. While there was overwhelming support for the project, which is heavily backed by the community – with one councillor saying that, for the first time in 16 years, he was prepared to vote against the officers’ recommendation – there was nevertheless a reluctance to ignore the highway issues. In an inspired move, the committee voted unanimously to delegate the matter to the officers, with the power to grant once the objections had been overcome, but, importantly, not to refuse, if they could not be. The Parish Council and members of the public spoke passionately in support of the project, and this was backed up by a powerful letter of support from MP, Nicola Blackwood. There was one objector, who also spoke. The decision was the best one for Radley because it should, indeed will, have have not one, but two, favourable consequences. The permission for the Wetland Centre will surely be granted but, in the process, the traffic problems in Thrupp Lane will, not before time, be addressed and hopefully sorted out to everyone’s satisfaction. For neither of these things to happen would be nothing less than an abject failure of both government and politics, and, as such, should be unthinkable. 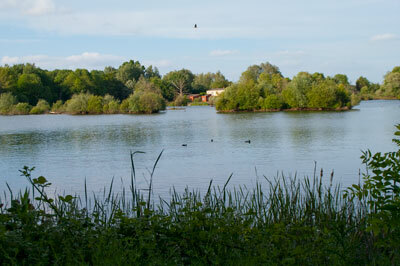 Thrupp Lake from the south, May 2011. The Sandles building, which the proposal would demolish, is visible just above centre. This would be replaced by the new visitor centre, which would be a much less obtrusive building located at the lake shore slightly to the left of where Sandles appears in this picture. A lot of work has already been done on the site, much of it by volunteers, to make it more attractive to visitors while maintaining or enhancing opportunities for wildlife. A shelter and a bird hide, have been constructed and a circular walk created around the lake with waymarkers and interpretation signs. The path, which comprises both public and permissive rights of way, was officially opened on Friday 17th June. Planning permission was finally granted on 7th February 2013. See News Story. Vale of White Horse District Council Planning Committee meeting 25 May 2011, Agenda.